Frequently asked questions about the Kerama Full Day Tour. From what age, can passengers ride on the boat? Passengers from the age of 0 can ride on the boat but due to sea conditions we ask for your understanding that passengers may be refused. What time will the tour start and end? Meeting time will be at 8am and we will return at about 3pm. Yes. Lunch and Tea are included. Please bring your swimwear and a towel. We ask that you wear your swimwear before the tour starts. You can bring them with you on to the boat. Is there a pick-up service? 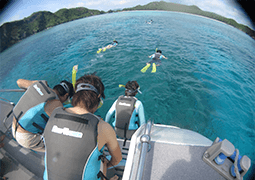 Customers who are participate in one of our diving tours can use the pickup service. Will the tour continue if it is raining? Yes. Even if it is raining we will continue the tour. Until what time can I make a reservation? Reservations can be made during our operating hours of 9am to 7pm the day before your desired tour. A. Reservations can be made during our operating hours of 9am to 7pm the day before your desired tour. From what time will a cancellation fee be charged? A cancellation will be charged 2 days before your desired tour date after 7pm. You can pay in cash on the day. How many meters do will we dive during the diving experience? We usually choose the depth depending on the customer. The deepest dive would be about 12 meters. How long will we be diving? We will be diving for about 15 to 20 minutes. 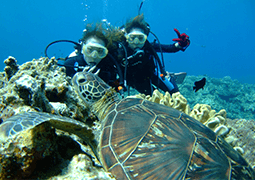 Can experience diving and FUN diving customers dive together? Yes, that's Okay. FUN diving customers will have to dive at the same depth and same amount of time as the Experience diving customers. It’s my first-time diving. Is it Okay? Yes, That's fine. We have many first-time customers joining our tours. 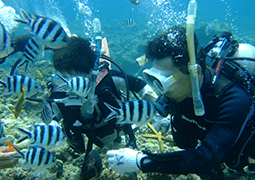 How many instructors will accompany 1 experience diver on the tour? We generally have 1 instructor for 2 experience divers. This may change depending on the customer. Will customers who are snorkelling have an instructor with them? Customers are free to enjoy snorkelling by themselves. Can we dive two or three times on the experience diving tour? Yes, you can. An extra dive each time will cost 5000 yen. Please ask our staff on the day If you wish to take another dive. Depending on the sea conditions there is a chance that the boat will rock. If you are worried, we suggest that you take some sea sickness medicine. 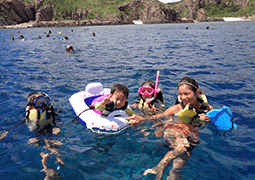 Frequently asked questions about the Kerama Islands Half Day Tour. What is the meeting time for the morning tour? The meeting time for our morning tour is 8am. The meeting time for our afternoon tour is 1pm. All you need is your swimwear and a towel. We have tea available on-board. Will you take a picture for us? We will take a couple of pictures for you. Where can we see the pictures that were taken today? We upload our photos to our homepage, Facebook and Instagram. You can download the photos from there. You can take them on board the boat with you. The payment for the option menu will be made after we dock back into Naha. How long will we be diving for? We will dive for about 15 to 20 minutes. Is it ok to request a service from the optional menu on site? Yes, That’s Okay. You can request for things like diving or jet ski. However due to time restrictions we recommend that you ask staff in advance. Yes, there are. We have toilets on our cruisers. Frequently asked questions regarding our private charters. We would like to know a rough price of how much a charter would be. If you contact us by our email info@reeffers.com we can send you a quote with how much a charter would be. Please don't hesitate to contact us. What are some of your recommended options? Our popular options are BBQ’s and Marine pack. We ask that you transfer the money previously or pay in cash on the day. Both are okay. Is it okay to bring food and drinks with us onto the boat? Yes, it is Okay. Although we have a fee of 5000 yen plus tax. What point’s will we go to? We will take you to very beautiful deserted islands. Can we land on the Islands? How many passengers can ride on the boat? Our Reeffers cruiser can carry a capacity of 42 people. Our Aquarius cruiser can carry a capacity of 57 passengers. What is included in the BBQ pack? We have items such as meat, sausages and seafood. Depending on your budget (from 2,500 yen) we can change the menu. Please contact us with your enquiries. What time is the meeting time? We often have charter bookings from 9am. However, as it is a charter you are able to choose a time that suits you. Can I operate the Jet ski? Only staff are allowed to operate the jet ski. Frequently asked questions regarding our Whale Watching tours. Is it a higher chance to see the whales in the morning or afternoon? You can see whales either time. Please choose the time that best suits you. Depending on the spot the whales are appearing or the day there is a chance the boat will rock. If you are worried, we suggest that you take some sea sickness medication. We will be selling some seasickness medication on the day at reception. Will we get wet when on the boat? When the boat is moving we will have customers sitting inside our cabin. When watching the whales, there is no cover so there is a chance you may be splashed. We will be selling rain coats on the day at reception. If you are worried, we recommend you purchase one. What kind of clothes should we wear? When we are watching the whales there may be some wind. We suggest you bring a jacket and wear warm clothing. For safety reasons, we ask that you don't wear high heels. Which is the best time during the season to see the whales? We suggest joining the tour during the peak season from February to March. We ask that you pay in cash on the day. We ask that you bring appropriate clothing. If you are bringing a bag with you, please stick to the minimum and bring your camera and valuables. There are many car spots available at Miegusuku port. A full days parking is 500 yen. There is no limit. However due to bad sea conditions elderly customers and infants may be refused. How long will we be riding on the boat? Including movement time and whale viewing time a total of 3 hours.